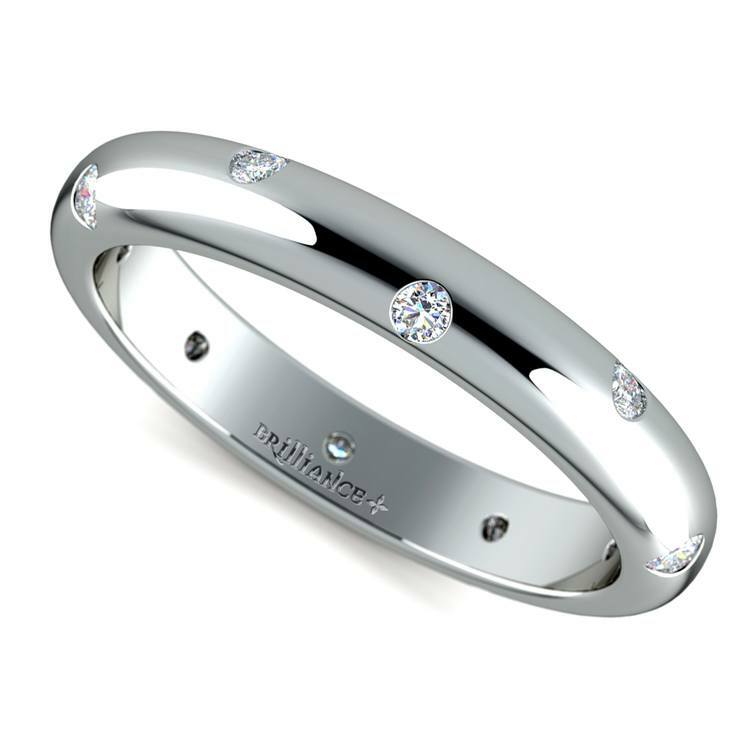 A small diamond wedding band is the most versatile choice for pairing with an engagement ring. Daintier diamonds are understated yet elegant and play demurely against dominant engagement designs. While a small diamond wedding band can be matched with almost any engagement ring, these delicate rings also are timeless pieces that look amazing when worn alone. 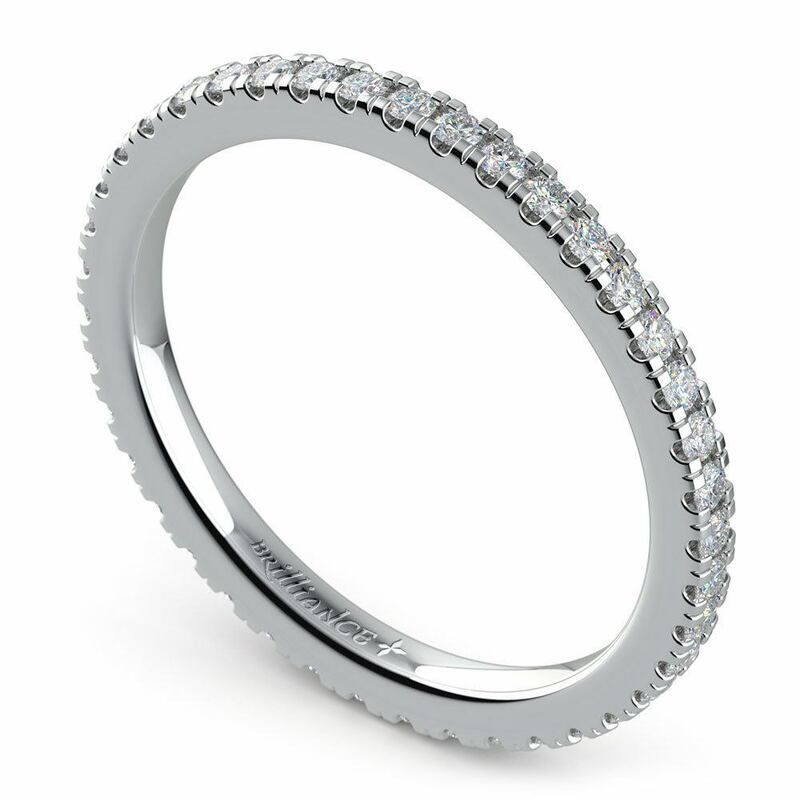 A row of small pave diamonds is the most iconic and classic design for a wedding band. The small diamonds add fire and interest but remain refined and unassuming, especially when paired with a larger engagement ring setting. The more diamonds you add into the setting, the greater the impact. 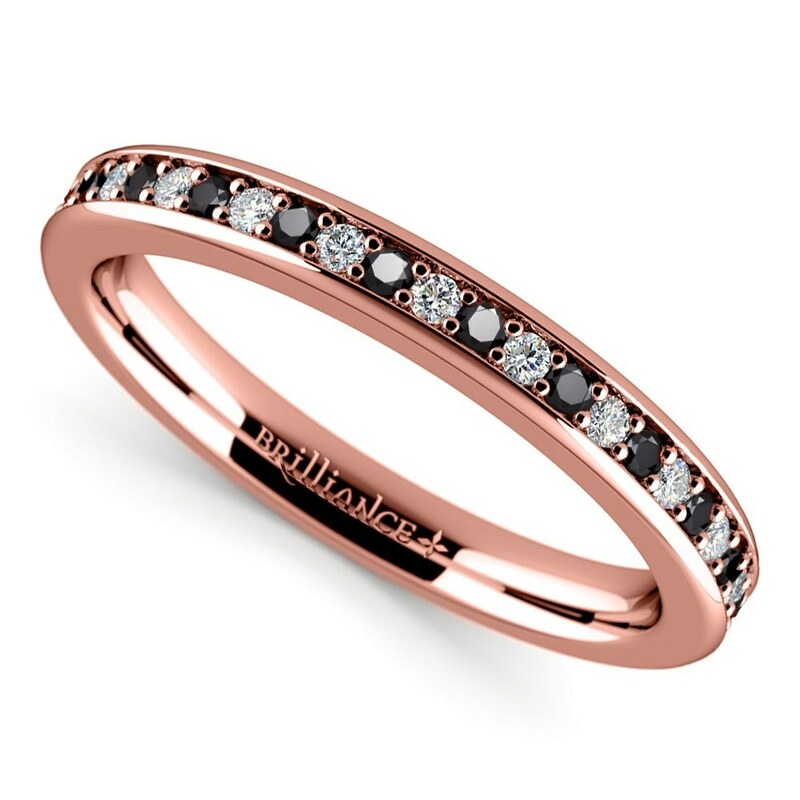 Add interest and a bit of color to your diamond band by alternating colorful gemstones or black diamonds in the setting. Choose your birthstone, the stone that represents your wedding month or use black diamonds to create a black-tie influenced style. For a more contemporary design, select a band that features small diamonds scattered throughout the setting. White diamonds are classic and elegant, while black diamonds create drama with their darkness. This style is a great choice for those who favor the simple and traditional wedding band but want a little something…extra. This also is a unisex design style and can be worn by anyone. 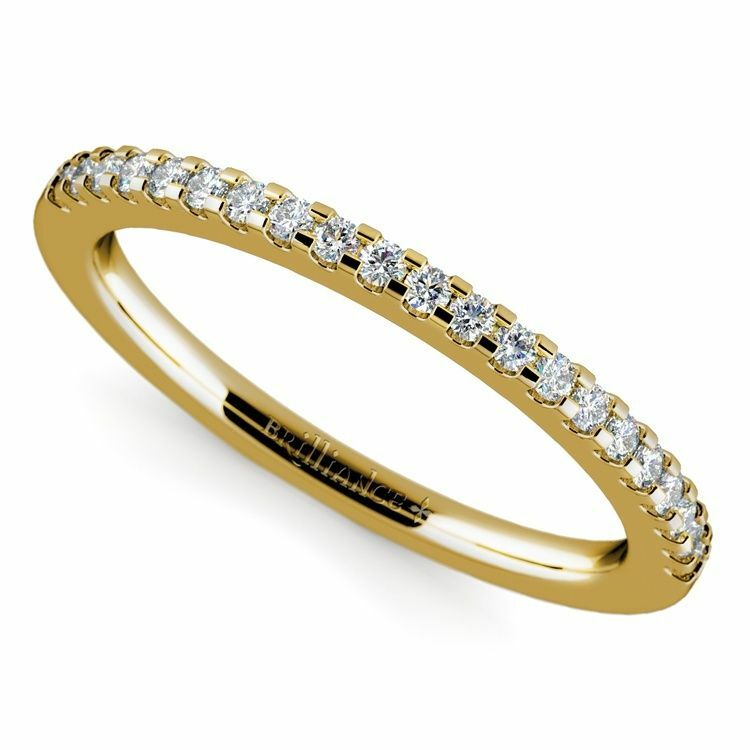 A single diamond set within the center of a band provides a demure accent and also draws the eye to the hand. This is a contemporary style choice, and the solitaire diamond band looks modern and chic when set next to a bezel engagement ring. For a more dramatic style, select swirled metal settings like Damascus steel. As this design is such a classic, it pairs well with almost any engagement ring design. And his ring also can be made to match. 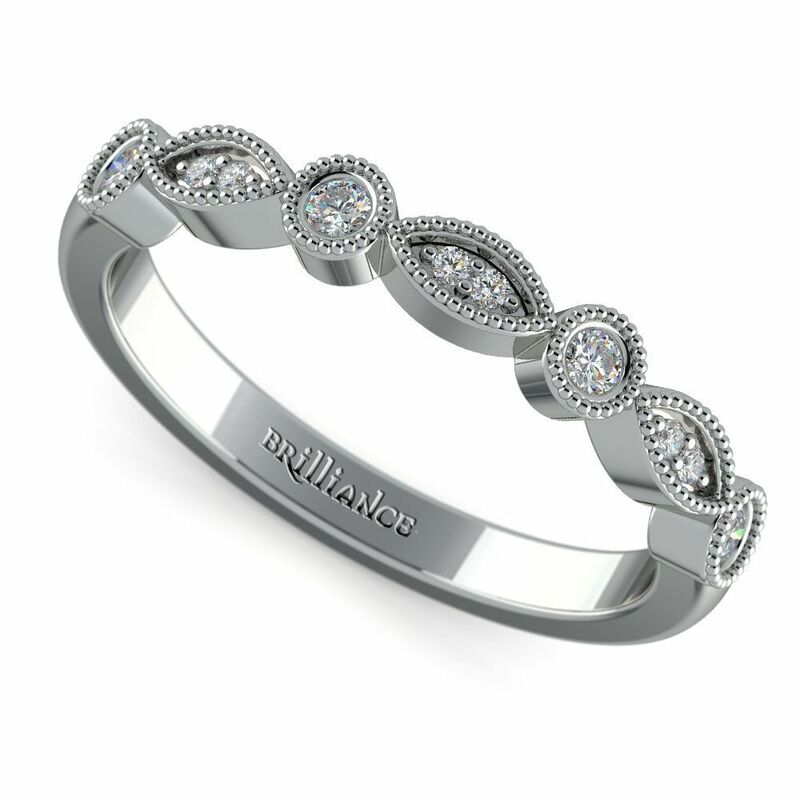 Small diamond wedding bands can also feature intricate vintage-inspired designs. Choose details that embrace an era that you love like milgrain beadwork to embrace the extravagance of the Edwardian Era or step-faceted diamonds that were on-trend during the Art Deco period. Small diamonds can celebrate luxury and style with an understated drama and elegance. Create a pattern with diamonds for a unique but simplistic design. 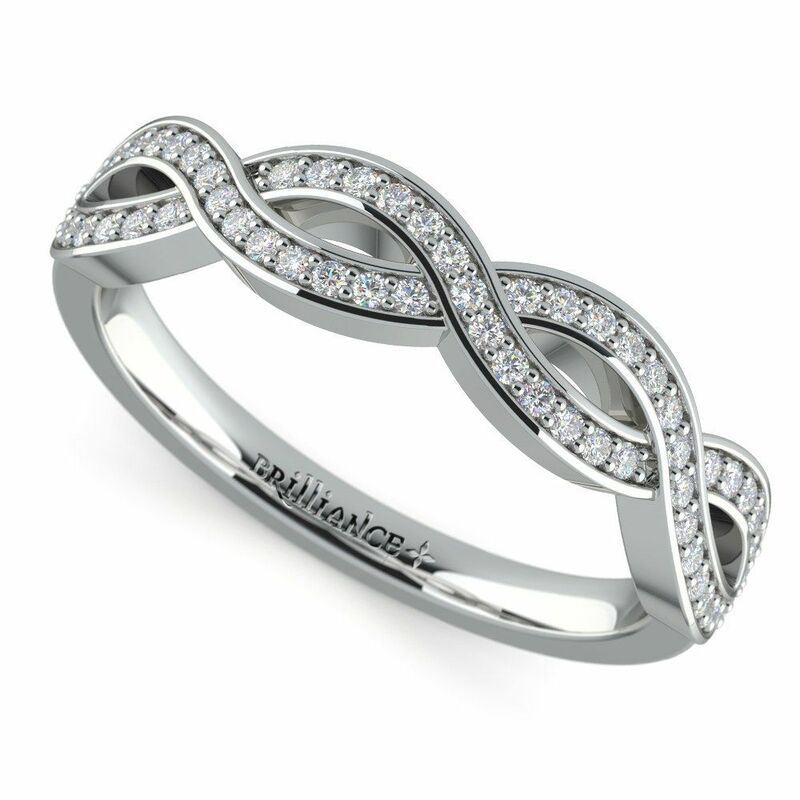 Etch a ring with swooping infinity symbols or draw winding diamond ribbons around the band. This style embraces a sweet femininity and sophisticated charm. An endless circle of diamonds represents the eternity of the marriage vows. This design is universally flattering, looks amazing as part of a set or worn alone and allows the hand to sparkle at every angle. Smaller diamonds keep this ring from overwhelming a matched pair, so opt for lighter carat weights when wearing it next to a dramatic engagement ring. A small diamond wedding band can be paired with almost any engagement ring to create the perfect ring ‘marriage.’ A pave row of diamonds and the eternity setting are the most classic choices for these rings, but there are many styles that embrace the small diamond appeal. Vintage-inspired designs add interest to the hand, and more modern designs like the diamond solitaire band are ideal for those who favor contemporary styles. Diamond wedding bands can also integrate gemstones for a pop of color, to commemorate your wedding month or to represent the birthstone of a beloved. 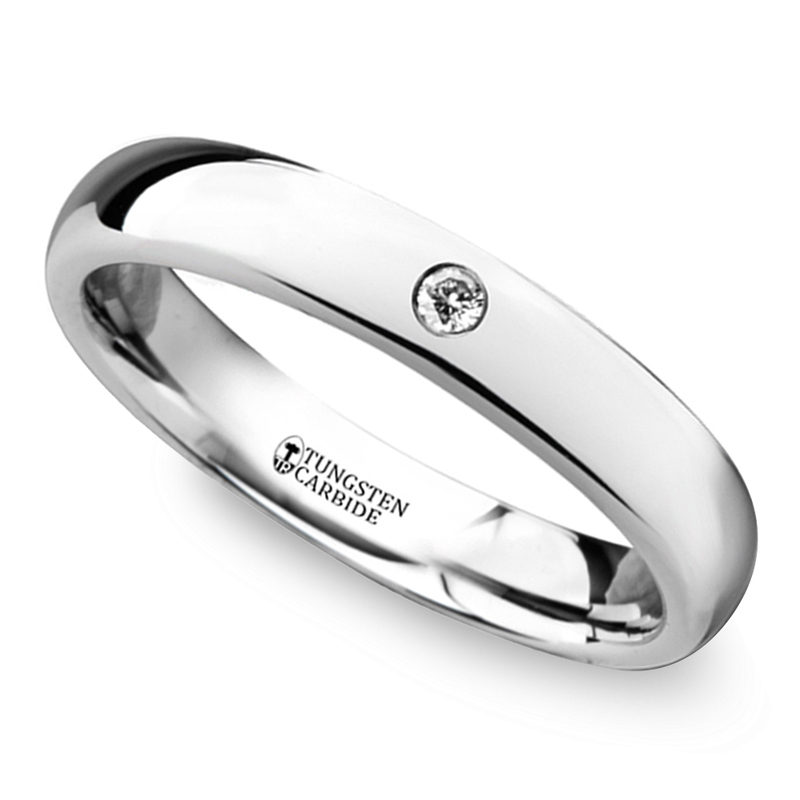 Regardless of the style or details, small diamond wedding bands embrace a timeless appeal for a lifetime of marriage.